Tostones, a traditional side dish made of green plantain is also known as “Patacones”. There is great debate on the origin of the Tostone, however, you may find them in many Latin American and Caribbean countries. The process is simple and the flavor is delicious – a staple to serve with many of our main dish recipes. Tools needed include: Wood plantain press and a nonstick saute pan. To peel the plantain, use a sharp knife to remove the ends, then carefully slice the peel lengthwise, 3 or 4 times all around, without piercing through to the “meat” of the plantain. Remove the peel with your hands. Cut the plantain into 1½-inch pieces. One large plantain yields about 6 tostones. Cook the plantain in the boiling water 15-20 minutes, or until they are cooked through. You can check for doneness by carefully piercing a toothpick through to the center – if it slides in easily, the plantains are cooked. Transfer the plantains to a paper towel to dry. Heat 1 tablespoon of olive oil in a large IMUSA NON-STICK SAUTE PAN over medium-high heat. Add the plantains to the pan, flat side down, and allow them to toast for 3 minutes on each end, until golden brown. Remove the plantains from the pan, but do not remove the pan from the heat. Use your IMUSA WOOD PLANTAIN PRESS to carefully smash the plantains. Because you are using little oil, they may stick to the plantain press, so use a rubber spatula to help you remove the tostones. Add another tablespoon of olive oil to the pan. Then transfer the tostones back to the pan. Cook for 4-5 minutes on each side, or until golden and crispy. Transfer to a serving dish and season with salt. 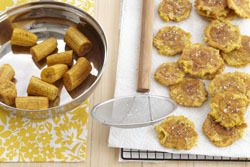 Tostones, a traditional side dish made of green plantain, are also known as “Patacones”. 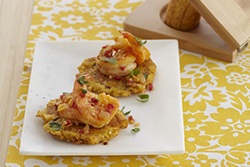 There are several ways to add variety to this delicious staple in many Latin American and Caribbean countries – we show you how with this recipe using shrimp! Combine the first six ingredients, mix well to coat and refrigerate the shrimp mixture for a couple before serving or overnight! Heat your IMUSA skillet and add about an inch of oil. Cut the plantains into ½ pieces and fry them in the hot oil until lightly browned. While removing each from the oil, press down on each with a wooden or non-stick spoon to hollow out the plantain so it looks like a small cup. Put each plantain cup back in the hot oil to let it crisp up some more. Another 5 minutes. Spoon in your cooled shrimp mixture into each cup and serve!